Daily Mail hack Quentin Letts can usually be found getting his knickers in a twist over some nonsense that even Theresa May would be embarrassed to mention. This time dear old Quentin is slating the police for being ‘thick or mouthy rozzers’. With language with like that you can imagine Daily Mail readers being so shocked it might interfere with their afternoon kip. So what hideous crime have the ‘rozzers’ committed? Well they dared to arrest, now wait for it, two ‘middle-class pillars’; Neill Millard is a director of Cavanaugh Wealth Management which has just sold out to merchant bankers Close Brothers, making the directors multi millionaires; and Jamie Hawksfield runs Equivision, which films horse riding events. In Quentin’s world the police officers behaved as if they were some sort of SWAT team with dawn raids, etc. If middle England wasn’t outraged enough by this he goes on to say Al-Qaeda suspects are treated better; thus copying the Prince of Wales claptrap that farmers are victimised more than “blacks or gays”. Now, no Daily Mail story would be complete without an example of a waste of tax-payers money. In this case Quentin claims £200,000 has been blown by Sussex constabulary investigating a Hunting Act case but fails to provide any proof. Given that Sussex police have not spent one penny gathering the evidence, as that was done by unpaid hunt monitors, their only expense has been for an independent expert witness so this figure is clearly utterly nonsense; journalistic standards are not very high at the Daily Mail nowadays. Poor Nicholas already had an axe to grind after being prosecuted and losing his driving licence a few years ago when a hunt monitor filmed him carrying children in an unsafe manner on a quad bike during a hunt meet! And Maude, another hunt supporter, is a part time church warden at the pro-hunt Shipley church, where the Vicar regularly “blesses” the hunt hounds of Crawley and Horsham Hunt at a ceremony at the church! 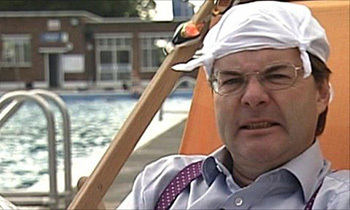 Senior officers at Sussex Constabulary must be particularly outraged by Quentin Letts abuse. But as we’ve stated elsewhere on this site, the Daily Mail have double standards when it comes to law-breaking by ‘middle-class pillars’, especially of the foxhunting variety.